Home » Poetry » Blogs » New Features on PoetrySoup! 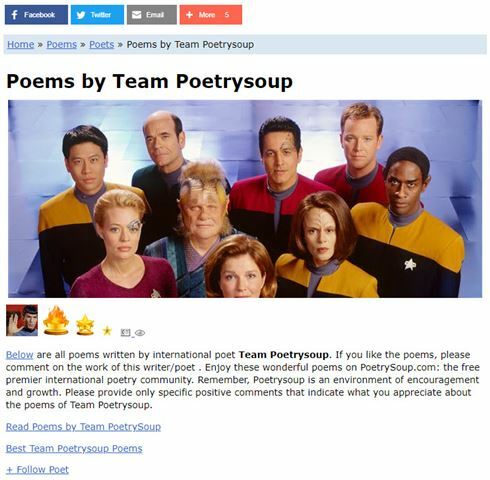 PoetrySoup is an internet poetry resource and community that encourages the writing of poetry through community involvement and support. Founded in February of 2005, this Free online poetry website allows professional and amateur poets, from around the world, to post their poetry online and receive reviews. This allows poets to increase exposure from their work while perfecting their craft. For those who simply like to read poetry, PoetrySoup also publishes poems in many categories and forms for wholesome reading pleasure. Hey Premium Members, you can now upload and attach photos to your poems. You no longer have to use an image on the internet. Check out the new Manage Photos/Images page. Also, you can now add a cover image to your poem homepage once you upload an image. Tried to do it uploaded my image and nothing is showing above my poetry page? Company seems to follow me. Not sure why. Gotta be prepared for anything. Brandy, remember you're a fine girl. You must take more care with the company you keep. Lol. You really do like that side of me. You don't really know that side. Perhaps a little. Let it go, let it go- I am not afraid of the cold. :) Let what go? :) You have no idea. I am holding onto the reins. And what side is that?? Son of Spock. Why remove it? I like this side of you. Rock on Brandy! Certain things cost money and disk space is one of those things. Still, there are a lot of free features on PoetrySoup. Brilliant - this will be a great improvement - I could rarely get photos from the internet to work and often skipped adding a picture because I didn’t want the hassle. Hi Panagiota, no that would still be breaking copyright. But if you have a photo you’ve taken, or a drawing, then you can upload that. Some photos are available from sites like wiki media on commons licenses or you can download images from sites like snapstock and unsplash which are available for all to use without a licence. But gee... what about us lowly non-preemies? Three words: "Pay and stay". If you have an AT&T, Yahoo, Bellsouth, SBCGlobal, Prodigy, or another AT&T affiliated email address...PLEASE READ! More new features have been added to PoetrySoup!!! Uh, Oh! PoetrySoup has done it again! How Does PoetrySoup Provide this Wonderful Website? PoetrySoup's new short story and fictional prose section is here…almost.